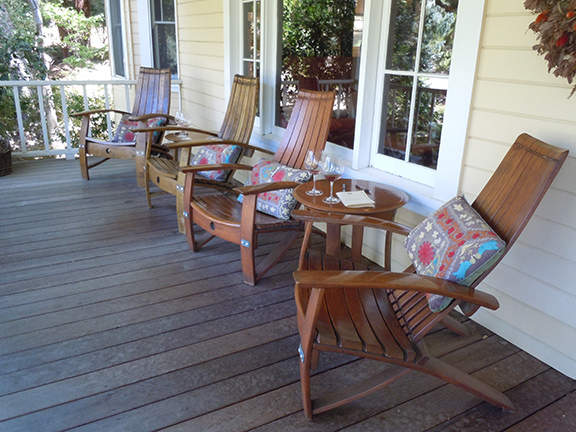 The picture of a simple farmhouse with cushioned chairs for relaxing are quite beckoning. This could be a property anywhere on Nantucket or in New England. The trees that surround the property are familiar, unlike the palm trees, for example in the south. 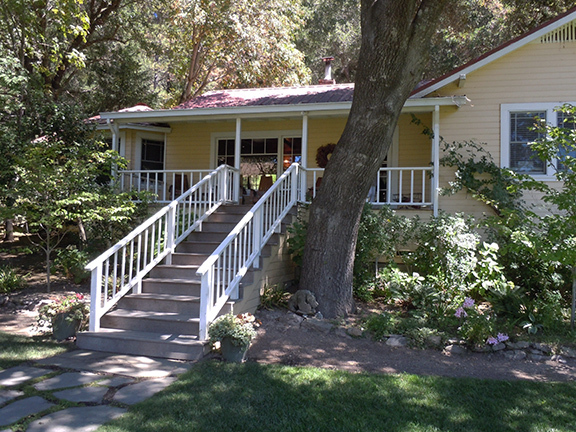 But this is a small, family owned vineyard in Calistoga, California and the house is where they have regular wine tastings, open by appointment to the public. However, unlike any other winery in Napa Valley, this one is owned and run by a Nantucket born resident, Ehren Jordan, son of Nantucket real estate owner, Lucille Jordan. It is a business residence but feels just like a home. In fact it is so laid back and comfortable that one can easily miss the fact that wine is being made here, except for the whir of trucks in the distance. Originally started in 1998 under the label Failla-Jordan, the winery released it’s first Alban Vineyard Viognier (Edna Valley) and Que Syrah Syrah (Sonoma Coast). Today, with 15 acres, this small vineyard produces Syrah, Chardonnay, and Pinot Noir that capture the essence of California’s coolest regions. Being new to the area we visited some of the names with which we were familiar; Sterling, Beringer, and Shramsberg and lots that have become a blur. In this region it’s simply one vineyard flowing into another as far as the eye can see,. And then there are the mountains! It’s a glorious sight so different from our own landscape. But it’s the smaller vineyards that are the most welcoming and comfortable for a wine tasting, which seems to have grown into the best social networking, public relations, marketing plan for getting the word out in a distinctly low-tech way. Imagine, being able to sample any product that is grown in this country in a leisurely manner and learning all there is to know about it? Being encouraged to ask questions while leisurely sitting on the front porch of someone’s home for an hour . Oh, and one more thing…. In exquisitely beautiful sunny weather! All the wine tasting experiences are NOT the same. 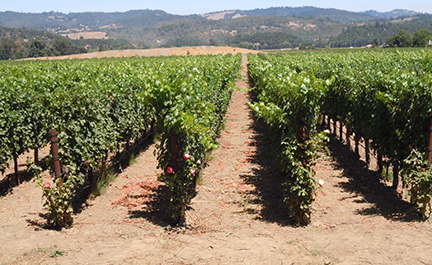 The very commercial vineyards like Beringer and Frank Family, owned by former Disney executive, Rich Frank, are not homey and warm and fuzzy feeling like Failla. When we arrived at Failla for a 12:30 tasting there was just one other couple on the porch. We were handed a printed card with the names of several different wines that we would be tasting. Each had a description under the name and the price. Obviously we were offered wines that are their “better’ and “best” quality. We were greeted by a knowledgeable and extremely personable fellow named Geoff . He began right off pouring a small amount of wine into everyone’s glass while telling us a few, not overwhelming facts, about the wine. He encouraged us to swirl, smell, sip and discard over the railing and into the hydrangea bushes. “I’m told the acidity in the wine will turn the blossoms from pink to that wonderful Nantucket blue,” he told us with a wink. When you go somewhere else and tell people you are from Nantucket they seem to warm up to you. They get friendlier as like-minded, small community residents often do. It’s like, ‘we grow grapes, you harvest scallops” sort of thing. After tasting five different wines, three red, two white, we knew a little something about why we liked one wine over another. We learned about the long slow process of growing, harvesting, and ultimately turning the grapes into wine. It brought us closer to understanding, that night as we were perusing the wine list at a local restaurant, why a bottle of good wine was quite pricey. Just like we know what it takes to get one tiny little Nantucket bay scallop from the ocean and ultimately onto our plates in scallop season. Leaving home can do this. It broadens us to know about other people’s worlds. Having traveled through the Loire Valley one September during wine harvesting time we were somewhat familiar with the process. But traveling through a part of our own country with nothing but miles and miles of vineyards brought it closer to home. And now that we’re back on Nantucket I cannot wait for those bottles of wine we purchased along the way to arrive on my doorstep. We can relive each experience all over again in a different way, knowing exactly where it came from and how it was created. If you’re interested in learning more about Failla Winery on the Silverado Trail in Calistoga, CA go to their website: faillawines.com.